Here the benchmark is the Dodge Challenger SRT Demon with its 6.2-L supercharged Hemi V8, producing 840 hp and 770 lb-ft of torque. That’s 0 to 60 in 2.3 seconds and a quarter-mile in 9.65 seconds with 100 octane fuel, straight from the factory. Contenders here come in the form of a ’69 Chevrolet Camaro, a 1972 Dodge Challenger Rallye and a Ford Mustang. As with any drag race, there are so many variables dictating the race from driver experience to engine setup, so the winners and losers here are not really the point. 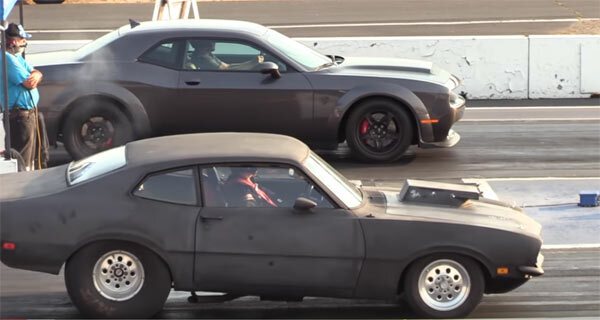 In many ways it is to see how the most powerful modern muscle car, optimised for the dragstrip goes up against some old school competition, just for the sheer hell of it…..